UPDATED: Thu., Nov. 2, 2017, 5:57 p.m. The Northwest Christian players might want to bring crash helmets for Sunday’s game at Gonzaga. The way the Bulldogs and their coaches were talking Thursday, they’ll be hitting the boards early and often in their exhibition game at McCarthey Athletic Center. That will make coach Lisa Fortier happy. “We’re spending a lot of time on it,” Fortier said after Thursday’s practice, a physical session that went half an hour longer than scheduled. “What you emphasize is what they (the players) value,” said Fortier, who goes into her fourth year with a lineup that’s great in the open court but “a little light” inside following the graduation of Kiara Kudron and Elle Tinkle. “I’m probably going to come in here tomorrow and tell them that every drill is a rebounding drill,” joked Fortier, who’s hoping for a return to the NCAA Tournament. “We need to do it by committee,” said Fortier, whose club got another boost during the day, receiving points in the first Associated Press poll of the season. That’s usually how GU does it. No player in program history has averaged double-digit rebounds for a season. Last year, Kudron led the way with 7.8, while seven others averaged at least 2 1/2. Expect more of the same this year. There’s some new length in the form of freshman twins Jenn and LeAnne Wirth, but the veterans will have to most of the heavy lifting in the paint. Mostly that will be junior Jill Barta (who averaged 6.0 boards along with a team-high 16.8 points last year) and Zykera Rice. Now a senior, Rice will be in the spotlight for the first time in her career. Last year she averaged 4.4 points and 2.9 rebounds but played less than 10 minutes a game. All of those numbers should go up this year. 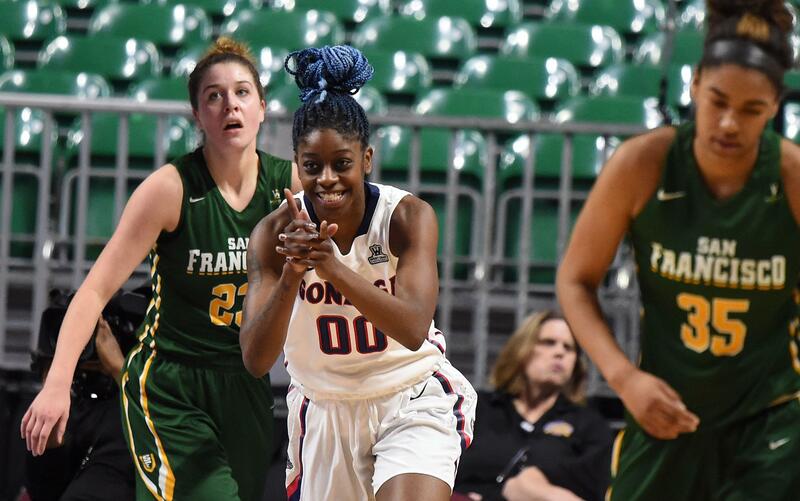 “We just have to make sure that we’re taking the rebounding drills seriously,” said Rice, who held her own during a recent closed-door scrimmage at California. “We want every team we play to see that we’re a hard-working team and that we are scrappers,” Rice said. Also expected to start Sunday is wing Chandler Smith, a 6-foot-1 win from Brewster, Washington, who managed almost three boards a game while playing 17 minutes a game. “The coaches are on us every single day,” Smith said. After Sunday’s exhibition, GU won’t be at home again until a Nov. 30 date with Eastern Washington. Published: Nov. 2, 2017, 5:51 p.m. Updated: Nov. 2, 2017, 5:57 p.m.